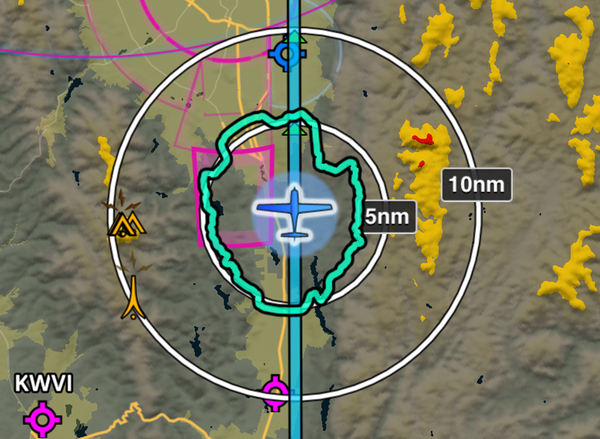 ForeFlight Mobile and Garmin avionics wirelessly connect, making everything from preflight planning to inflight rerouting easier and faster. 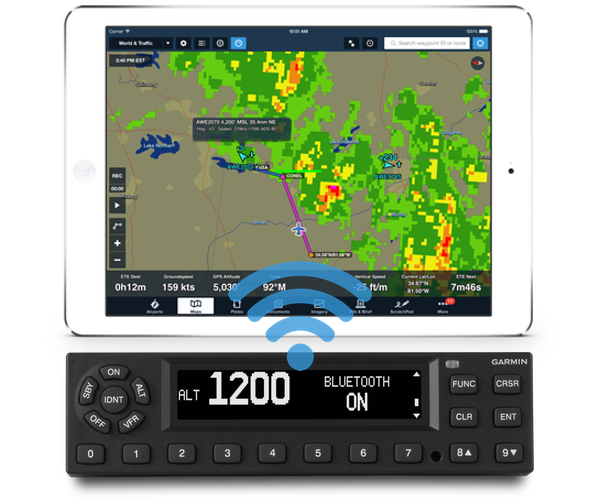 ForeFlight connects to Garmin installed avionics via the Flight Stream 110, 210, or 510 – Garmin's Bluetooth wireless gateway. Flight Stream can enable convenient two-way flight plan transfer, and the display of subscription-free ADS-B weather, traffic, backup attitude, and GPS data in ForeFlight. 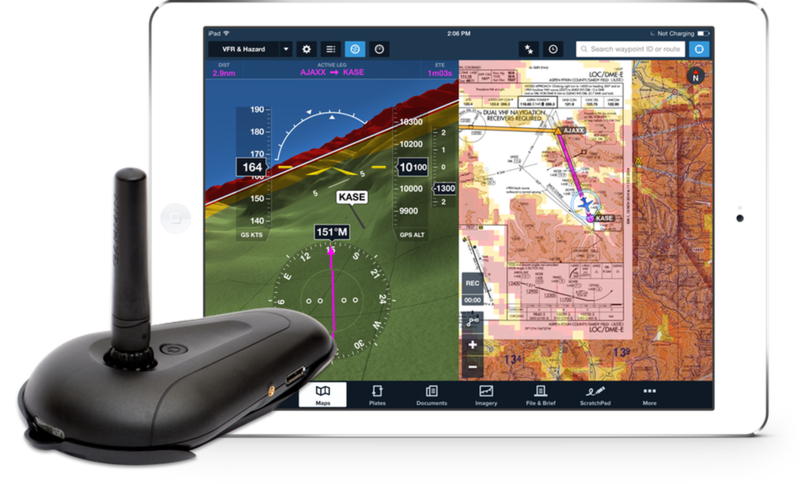 Garmin’s GTX 345 and GTX 335 all-in-one transponders meet the requirements of the FAA’s ADS-B Out mandate with the added benefit of ForeFlight compatibility. Depending on the model you choose, wirelessly deliver (via Bluetooth) FIS-B weather, ADS-B traffic, GPS data, and attitude information to your mobile device. Fly with Garmin's new line of portable receivers and connect to ForeFlight. 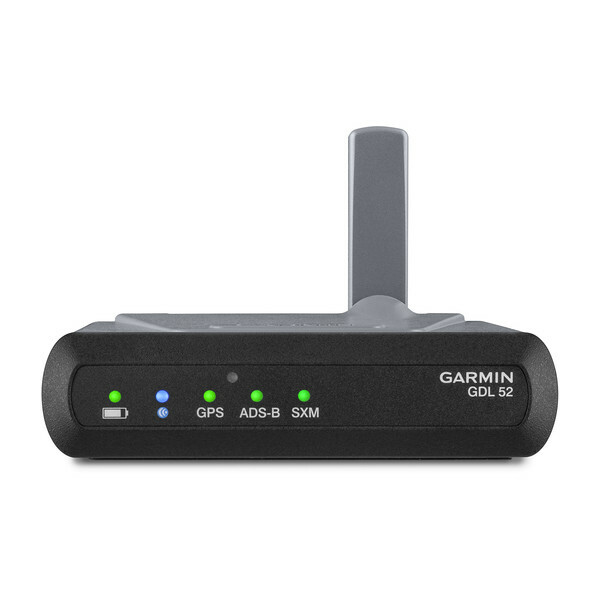 The GDL 50 includes a dual-band ADS-B receiver to display traffic and weather, the GDL 51 includes a SiriusXM receiver to display satellite weather, and the GDL 52 combines both receivers in a single device. All three devices also provide GPS data and backup attitude (AHRS). ForeFlight is fully compatible with the GDL 39 and 39 3D ADS-B receivers. The portable GDL 39 delivers ADS-B weather and traffic, as well as GPS data. 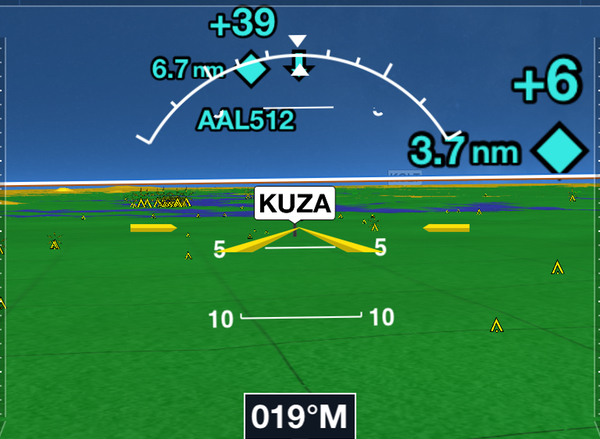 The GDL 39 3D, with its internal attitude sensor, adds dynamic pitch and bank information to ForeFlight’s backup attitude and Synthetic Vision views. The seamless integration between ForeFlight and Garmin makes flying easier, safer, and a joy. Click the button below to access a detailed guide on the features available with a variety of Garmin equipment. Keep your panel and your iOS device in sync via Garmin Flight Stream 210, Flight Stream 510, or G3X Touch display. ForeFlight displays a full range of ADS-B or SiriusXM satellite weather and ADS-B traffic information from compatible receivers. 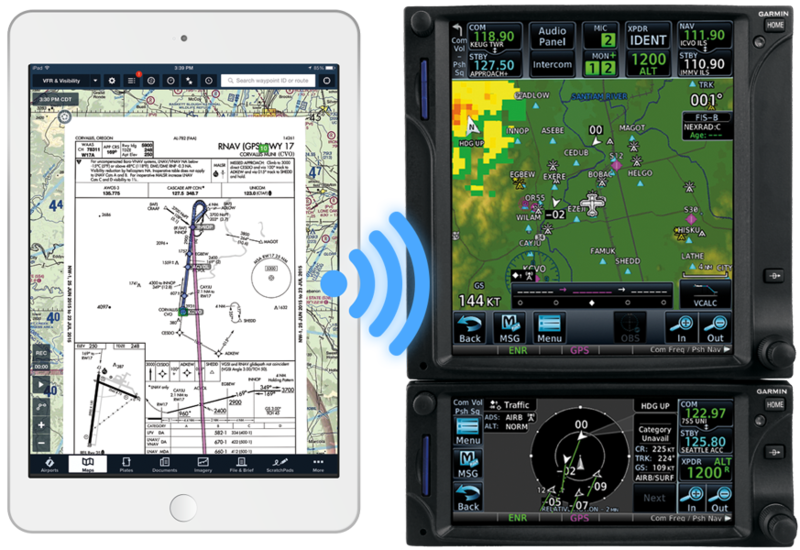 The Flight Stream 210, GTX 345, and GDL 39 3D provide dynamic pitch and bank information to ForeFlight’s backup attitude and Synthetic Vision views. 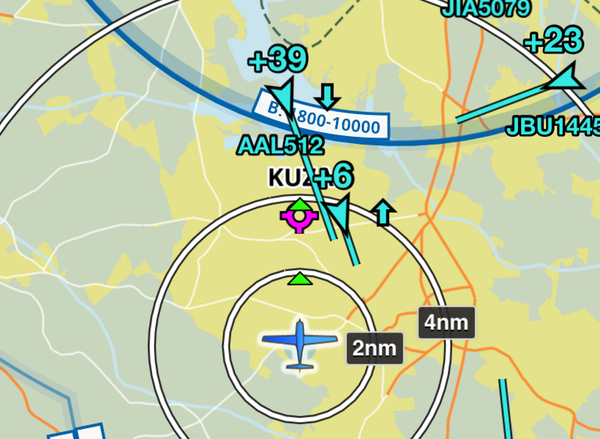 WAAS GPS information can power ForeFlight's dynamic moving map to enhance situational awareness in the air and on the ground. 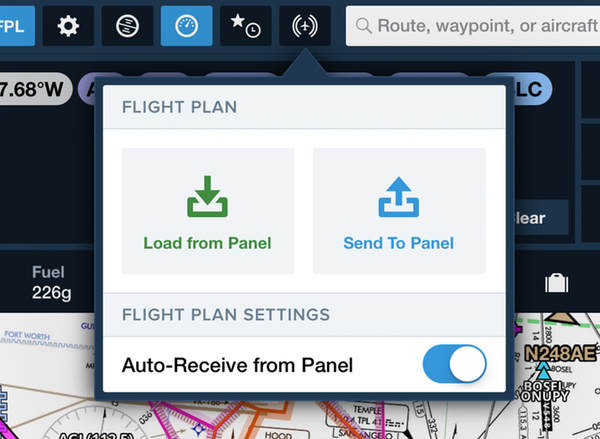 ForeFlight’s Connect platform gives pilots a more efficient and enjoyable experience so you can focus on flying. This exciting integration opens communication between ForeFlight and your Garmin panel-mount avionics.